Dynamical vs protocol-based neurofeedback? Home unit or training in office? What is right equipment for you and at what cost? It's a challenge to learn everything about a new technology. That's why our experts bring you clear information and tips on your brain training. Learn how to choose your equipment and trainer here. Neurofeedback, or brain fitness training as some call it, is recognized and growing in popularity. Consumers need help to understand what is the best way to train with neurofeedback and what is the best neurofeedback wellness equipment. There are a number of different systems on the market. But before learning about the different brands it's important to understand that there are two basic types of neurofeedback. Dynamical or protocol-based neurofeedback – What's the difference? Linear neurofeedback was the first generation of brain wellness training systems. There are a number of devices on the market, including EEGer, Cygnet, Lens, Brainasium, LoReta, and BrainPaint, which require a brain map assessment before training can begin (except for Cygnet). That map is used to create a protocol for training by a clinician. Why do linear systems create a brain map before training? This has to do with the principle that these wellness devices require a "map" made up of measurements of the client's existing brain wave patterns. The clinician then creates a protocol to adjust the frequencies of those brainwaves to fit your brain to a pre-existing model of a "normal" brain. With linear brain training, a client relies on the skills of a clinician, who establishes a protocol program for the client. Errors in adjusting frequencies can create side effects, so the skill of the clinician is very important to consider with linear neurofeedback. Within the field of neurofeedback, brainwave "lengths" represent measurements of the brain's electrical voltage, which is translated through mathematics into different frequencies. These frequencies have names, such as Theta, Beta, Alpha, etc. and are associated with different brain functions or states. For example, based on your brain map, the clinician might assess that you have too much Delta wave activity and not enough Alpha wave activity. She will create protocols to help the brain shift those frequencies, and will use client reports and mapping results to check on changes from session to session. A series of sessions will bring the client closer to optimal brain wellness. What are the cons of linear neurofeedback? It is expensive. A brain map costs $500 to $3,000 before any brain training sessions begin. 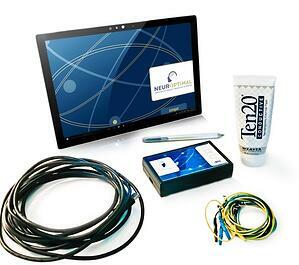 Linear devices are almost always used in an office setting with a clinician overseeing the training. Including clinician fees, client travel time, scheduling and other logistical costs, the cost of a training package can be very high. The second type of neurofeedback is called Dynamical neurofeedback, and there is currently a single device on the market, called NeurOptimal. This second-generation brain fitness technology was initially conceived of by Dr. Valdeane Brown in the early 1970s. The technology didn't reach its fully intended design until 2005, when computing power and speed (at the speed of micro-seconds) enabled real time monitoring of brain wave activity in portable, laptop size systems. NeurOptimal® is marketed as the most advanced iteration of brain wellness technology based on advanced research into the non-linear electrical patterns of the brain. Dynamical neurofeedback simply provides millisecond-by-millisecond feedback to the user's brain and the brain does the rest. Nothing is added or forced. No clinician or brain map is required. It is built on the recognition that the brain has it's own natural, inherent capacity to rebalance wave pattern frequencies using this feedback. The advancements in this current generation of neurofeedback is due to advances in the field of neuroplasticity, and the theories of brain functioning by neurologist, Karl Pribram. 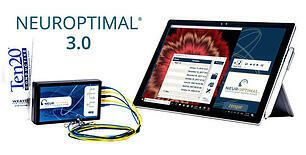 The latest version of the technology, released as NeurOptimal 3.0 in spring of 2017, uses the proprietary software, now formatted on a tablet-sized computer, with with the real time brain wave monitoring, software analysis, and the ingenious use of audible sound to feed back to the user real-time information on the electrical patterning of the brain. NeurOptimal is FDA approved as safe for consumers to use without a doctor's permission. Research Based neurofeedback technology or cheaper gimmicks? Clinician: Do I need to train in an office with a clinician in order to get effective training? If you are looking at protocol-based neurofeedback therapy (where a brain map must be created before starting), then yes, you want a qualified clinician with years of experience, administering the neurofeedback training. As mentioned above, with protocol-based systems, it is the trainer who alters your brain wave activity based on comparing your brain's electrical patterns to "normal" ones. The Dynamical Advantage: Dynamical neurofeedback technology works by giving the brain immediate feedback about itself that triggers the brain's natural self-correcting function. The technology here doesn't push or force the brain to change. It serves as a mirror, that alerts the brain to an imbalance and lets the brain adjust itself. The second advantage is its non-invasive technique. There are no forced brain frequency changes created by a clinician or trainer, so is no need for a clinician to monitor the system while you train. Cost: Price is a key factor when choosing among brain training devices. Here we have to be careful, as neurofeedback training is not an inexpensive activity, and there are many cheaper products that claim to provide similar results. Having evaluated some brain training units in the $200 range, such as NeuroSky, we see fundamental differences. These products often provide some basic monitoring or give prompts for the user to react to. Some devices try to trigger the brain to change its state. While many users enjoy these inexpensive products, they do not have the sophisticated software needed to support real-time feed back that can keep up with the lightening speed of the brain. To use an analogy, if you were choosing an audio system for your home you could choose an AM/FM radio, on-line streaming, or an advanced analog/digital system. Today the highest quality neurofeedback training systems range from $7,000 for a home system to over $10,000 for a professional one. We believe that NeurOptimal Dynamical neurofeedback technology is the best choice for brain training. For most users, buying a system is unnecessary. Neurofeedbacktraining.com and other providers allow customers to rent professional level neurofeedback systems by the month at an affordable cost. Our goal is to give clients and their families everything they need to receive the benefits of Dynamical neurofeedback on their own schedules, without investing in brain maps or clinical visits. Learn more about renting a home system. Altering Brainwaves & Safety: True neurofeedback devices do not add any electrical waves or currents to the brain. Any feedback device that stimulates the brain through micro-currents is technically not a feedback device. These systems introduce electrical currents to the scalp to effect a change. This may be another important point when considering the right system for you and your family. 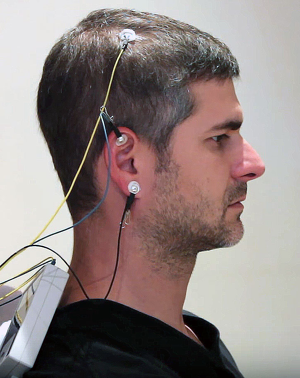 Do you want the device to send additional currents to the brain? Brain data transfer: Neurofeedback systems use EEG sensors placed on the scalp to collect real-time electrical information from the brain and send it to the software system for processing. For neurofeedback to work, this information must be transferred to the neurofeedback device via a wired or wireless system. The general rule is that a wired system provides faster and more accurate data. In order for the training to be effective, that electrical information has to be delivered at the speed the brain communicates, which is microseconds. The connection spot between sensors and the scalp has some natural resistance. A sign you're looking at professional-grade neurofeedback fitness device is that there is a "goop" involved. This can be a conductive paste or a gel. Its role is to support the speed and accuracy of data transfer. This paste is easily removable (non-toxic and water soluble). You can read more about it here. In addition to hair, skin and air, 60 Hz 'noise' is another common form of interference in most buildings and homes. Most linear neurofeedback systems do not have the ability to ignore the non-brain electrical "noise". The NeurOptimal software does factor out environmental electrical noise. Once clients have decided they want to try neurofeedback, the most popular option they choose is a rental, especially when multiple family members are training. Same training as in office visits. Learn more about renting a home system. 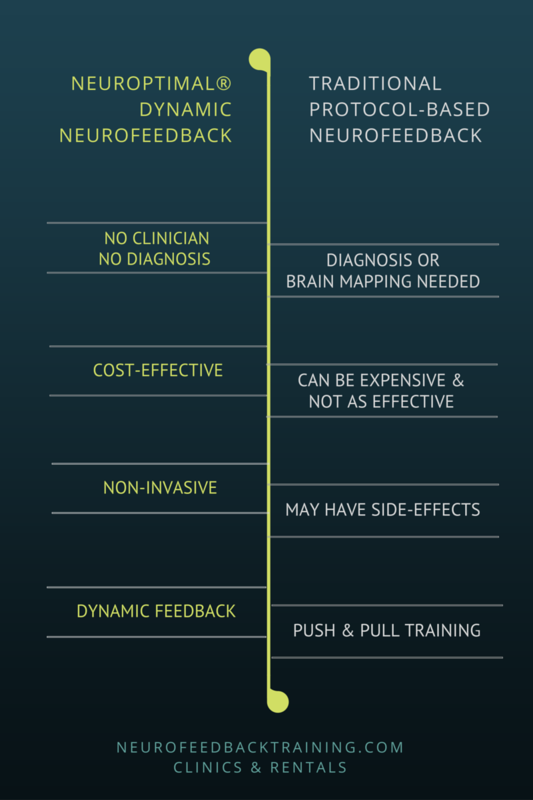 Not Sure if Neurofeedback is right For You? We're Here To Help! Schedule a free consultation with one of our expert Neurofeedback Coaches. 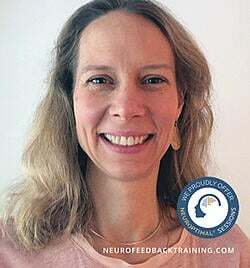 Natalie N. Baker, LMHC, is the founder of Neurofeedack Training Co. and certified Advanced NeurOptimal® Neurofeedback trainer. 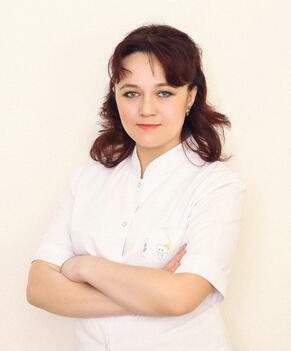 She holds a Master's Degree in Counseling and has been working as a psychotherapist since 1999. As a practicing Buddhist since 1991 and a meditation teacher since 1998, she combines her Western and Eastern approaches bringing a broader perspective to mental health and wellness. In 2010 she added neurofeedback therapy to her practice as additional support for optimizing wellness.